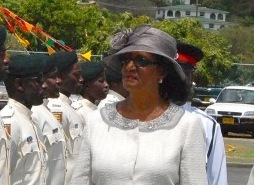 Grenada’s Governor-General is to be knighted. Governor-General, Her Excellency Dame Cécile La Grenade, GCMG, OBE, PhD, is out of the state from 5–22 July, 2014. She is accompanied by her Aide-de-Camp, ASP Randy Connaught. Dame Cécile will have a private audience with Her Majesty The Queen on 9 July, and will be knighted at Buckingham Palace two days later. Following these activities, Dame Cecile will travel to the United States on private business. In her absence Senator Dr the Hon Lawrence Joseph, President of the Senate, will function as Deputy to the Governor-General.